After Death of a Loved One, Haitians Must Choose: Lifetime of Debt or a Funeral? Imagine coping with the death of a loved one, and being told that you must pay more money than your annual income to ‘properly’ bury the deceased. 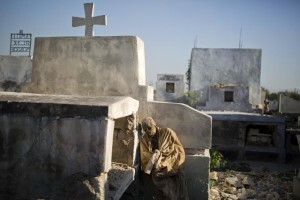 This is the reality for many impoverished Haitians when they are at their most vulnerable and grief-stricken; they are charged exorbitant fees solely for the profit of those in the burial business, who exploit the family members’ unawareness of cheaper options and their desires to pay respect to the deceased. 2/3 of Haitians live on less than $2 per day, and funeral fees will put them into debt for years to come. This issue continues to be of critical importance as the death toll from cholera, food shortages and natural disasters continues to rise daily. Aspasie Tanis lives hand-to-mouth on the edge of eviction in the best of times, scraping out a living selling packets of spaghetti and cookies outside her low-slung concrete shack in Haiti’s capital. Now the death of her father by stroke threatens to send her into a lifetime of debt. The distraught single mother is frantically seeking loans from friends and pastors to pay for the cheapest funeral on offer. Hospital morgue officials say her father’s body will be dumped in a pauper’s grave unless her struggling family forks over a relative fortune of just over $1,000. “I’ll never be at peace if he isn’t buried properly,” Tanis said quietly after transferring her father’s corpse to a cut-rate private morgue. Her anxiety is shared by many in Haiti, where two out of three people live on less than $2 per day and burying the dead is a predatory business. While funerals are costly in any number of countries, Haitian undertakers get away with charging rates that exceed what most citizens earn in a year. Along the capital’s bustling Rue de l’Enterrement, established morticians and unlicensed freelancers engage in a daily bidding war for new customers while telling bereaved families that anything less than their set packages can be seen as a lack of respect for the dead.